There is no end to the variety of activities available to Benzie County Area visitors and residents alike. 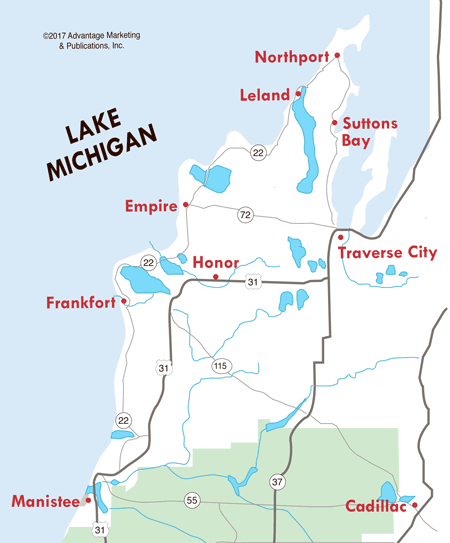 In addition to sandy beaches along the Lake Michigan shoreline, the county is home of part of the Sleeping Bear Dunes National Lakeshore, lighthouses at Point Betsie and Frankfort, and the Betsie Valley Trail for hiking and biking along 22 miles from Elberta to Thompsonville. While in Benzie County, visit the four-season family resort at Crystal Mountain in Thompsonville where you will find slopes for downhill skiing, trails for cross country skiing, and in the summer months a 36-hole championship golf course. Be sure to visit some of the following attractions. The newly renovated historic Vogue Theatre in downtown Manistee offers a movie experience unlike any other! Relax in our comfortable theater chairs and enjoy a first-run movie, weekly $2 classics or $.25 kids movies! Our ticket and concession prices are family-friendly! Call or check online for our movie schedule.